First, let’s get the film’s flaws out of the way. At 136 minutes, it’s far too long. James Mason as the villain is unfortunately given far too little screen time. 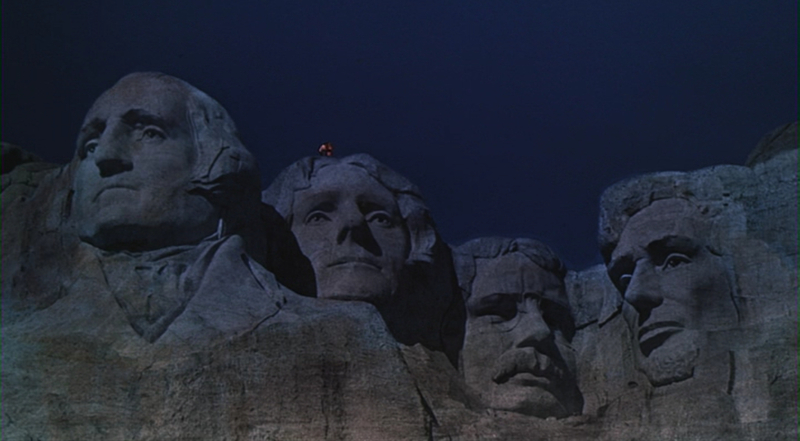 The famous finale at Mount Rushmore is, for me, not as exciting as I think it could be, and several of the effects shots are rather shoddy. The plot itself doesn’t hold up to much scrutiny, and the famous crop-dusting scene – brilliant though it is – is the most ludicrous way to dispose of someone: wouldn’t it be easier to just drive by and shoot him? All that aside, it is still wonderfully enjoyable and holds up to repeated viewing. It’s a great piece of romantic suspense cinema. 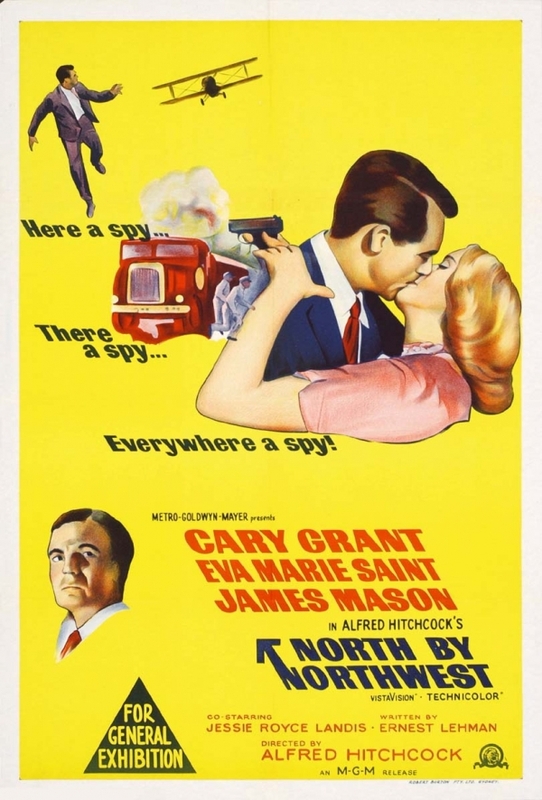 Hitchcock turned down the suggestion of Cyd Charisse as the girl, casting Eva Marie Saint instead, and we should be happy that the hero is played by smooth Cary Grant instead of drawling James Stewart, who was the original choice. Screenwriter Ernest Lehman wanted to write “the Hitchcock film to end all Hitchcock films”, and ‘North by Northwest’ is a marvellous retread of the best of Hitchcock, combining parts of ‘The Thirty-Nine Steps’ and ‘The Man Who Knew Too Much’. It has many of Hitchcock’s great touches: a fantastic score by Bernard Hermann, a title sequence by Saul Bass, an ice-cold blonde, a suave villain, a powerful mother-figure, and a shallow, sophisticated big-city hero caught in a story of intrigue that will put him in peril in a sequence of masterful set-pieces. Of course Thornhill calls his mother. He still lives with her. He is still essentially a child, even if he is a ladies’man. Mind you, he’s the one who gets seduced by the beautiful Eve Kendall (Eva Marie-Saint). She turns out to be the mistress of the chief villain, but also a double agent. Their romantic meeting on the train has been copied several times, most recently in the forgettable ‘The Tourist’ with Angelina Jolie and Johnny Depp. The villains think Thornhill is a man called George Kaplan, who it turns out doesn’t exist. He’s a fiction created by the CIA as a decoy so the bad guys don’t realise that the real CIA agent is right under their nose. The McGuffin – only revealed at the end – is some microfilm they’re trying to smuggle out of the country. Having failed to kill him in the car, they try again, luring him to an Iowa cornfield, where they try to kill him with a crop-duster. 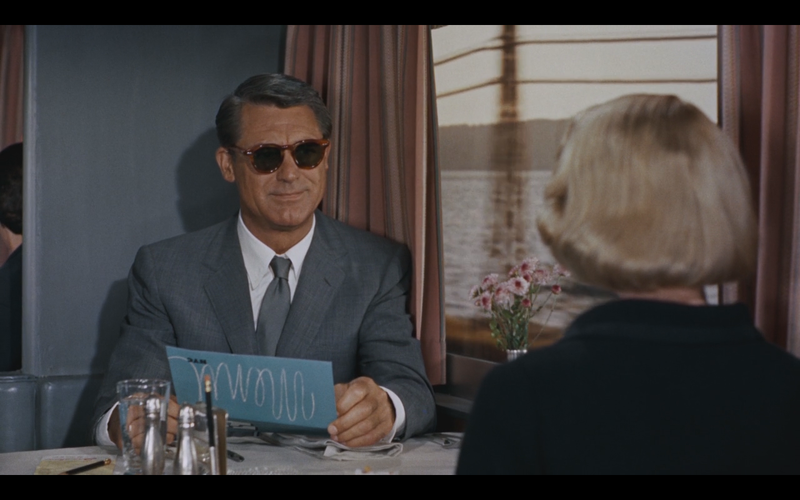 The reasons for the scene makes very little sense, but it’s so brilliantly conceived and constructed – nearly six minutes of silence before anything happens – and the fact that it’s Cary Grant in a nice suit being chased by a plane, make it unforgettable. As great a film as ‘North by Northwest is, I’d probably still choose to watch Hitchcock’s ‘The Thirty-Nine Steps’ first. It treads similar ground with verve, wit and economy (a mere 81 minutes), and is beautifully filmed in black and white, instead of the rather lurid technicolour of the 1950s. Well, a review of a film I didn’t like much, directed by someone who I think is habitually overrated. It’s probably just me though. Great stuff nonetheless Niall. Regards, Pete. I agree about early Hitchcock. Something odd happened to him in Hollywood, I think (Leslie Halliwell said he succumbed to elephantitis, so that the brisk ’39 Steps’ became the too long ‘North by Northwest’ and ‘The Man Who Knew Too Much (1934) was remade in Holywod 20 years later: an hour longer and not half as interesting.) I think he made 5 truly great American films: Psycho, Strangers on a Train, Marnie, Notorious, Rear Window; a handful of good ones (Vertigo, Spellbound), some rather bad ones (Rope) and a few oddities (I think The Birds is a an oddity rather than a bad film) His early British stuff is great, especially The 39 Steps, simply because it seems so effortless. Thanks for reminding me about ‘Strangers on a Train’, it is a corker. We will have to agree to disagree about Psycho though, for my money one of the most over-hyped films in the history of cinema. That’s why I love blogging; opinions and debate, in a civilised way! Brilliant. Cheers Niall. This is cued up ready to watch one day. One day! I remember seeing Vertigo and being taken aback by it. It was the first “oldie” I actually sat through and enjoyed (aside from The Wizard of Oz). The scene in the museum with the painting of the woman with her hair done in a very specific way gives me goose chills (even today). After seeing that I couldn’t get enough of his and other classic films. 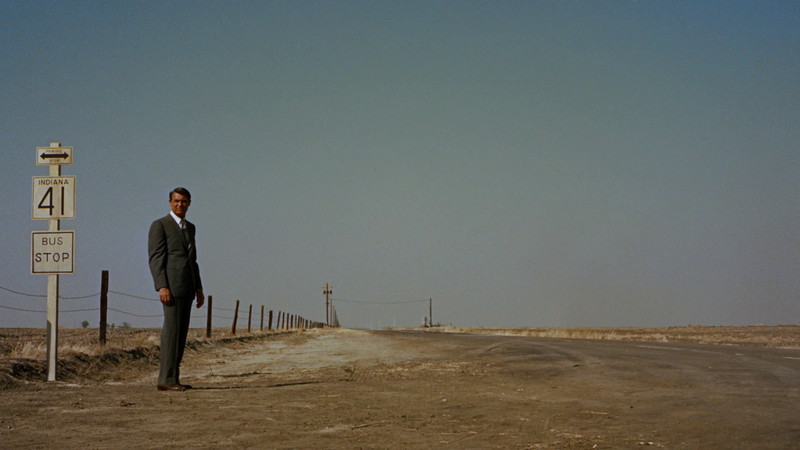 As far as North by Northwest goes, I think it’s a wonderful achievement on the production side and I’m down for supporting any filmmaker that has the go-nads to: speak out against the corrupt NYPD who were looking for handouts from the production in exchange for ease of filming, on top of filming at the United Nations without permission. The audacity makes me smile.